Before we go on, if you prefer a video over reading, the content of this article is summarized in the video below. Data-driven creative, also frequently referred to as programmatic creative, leverages customer data insights and machine assistance to create personalized ad executions that boosts performance and maximizes ROI. By activating their data and technology investments, brands and advertisers can cut through the clutter to provide real value to customers, and as a result, achieve high-performing campaigns. Data-driven creative involves using information about a customer to inform creative messaging. By using data, the marketer optimizes creative development resources and minimizes wasted media dollars delivering ineffective or irrelevant ads. Examples of data that might inform the creative include audience demographic data, CRM data, and customer journey stage. However, virtually any data signal can be used. More detail on the most common types of audience segmentation data can be found later in this article. Where does data-driven creative fit in the marketing strategy? Data-driven creative is a subset of data-driven marketing. All marketing is a combination of media and creative whether it’s running on your own website or on paid placement elsewhere. Data-driven creative strategies relate to planning the approach and resource allocation of a marketing team towards achieving a goal. Data-driven creative tactics refer to the specific implementation and execution of a creative based on the data available. Marketing leadership—whether it’s the brand manager, content lead, or marketing manager—typically set the data-driven creative strategy in consultation with media, creative, and data stakeholders. Content producers, creative managers, and campaign managers often execute the data-driven creative tactics. According to the 2017 Global Review of Data-Driven Marketing and Advertising report, 79.6% of respondents stated that customer data is crucial to their marketing and advertising efforts. Data has rapidly evolved to become a critical pillar for global marketers to purchase advertising, evaluate consumer media and deliver powerful consumer experiences. Additionally, in a study briefed by Marketing Dive, 71% of consumers prefer personalized ads. Consumers were nearly twice as likely to click-through an ad featuring an unknown brand if the ad was tailored to their preferences. This study demonstrates that consumers are now increasingly expecting their ad experiences to be relevant and useful. In order to create a more compelling user experience across audiences, brands and advertisers need to strategically incorporate their targeting capabilities into their messaging. Personalized, data-driven creative will ultimately enable marketers to deliver hyper-relevant messages tailored to the right viewers at the right time. Let’s take a look at how to achieve data-driven creative with both data and technology. Leverage the full potential of your ad technologies provided by your Demand Side Platforms (DSPs) and Data Management Platforms (DMPs) to inform your media strategies and data-driven creative. With these insights provided by DSPs and DMPs, marketers have the ability to more effectively reach different audiences with messages that are relevant to their interests, needs, and pain points. More specifically, segment your target audiences into groups and tailor custom creatives to increase the impact for each specific group. Behavioral data enables targeting based on a user’s previous web browsing behavior across the internet. By placing a cookie on a user’s browser, various behaviors are collected including websites visited, page views, clicks, downloads, and video completions. Users with similar online browsing behaviors can be grouped together into one segment and targeted with a message that caters to their interests. Contextual data enables targeting based on the content viewed by the user. Both the content and keywords displayed on the page are captured. Contextual data is most effective for targeting a consumer’s present web behavior and aligning the ad messaging to the content they’re viewing. Psychographic data provides insight on “why” customers might buy from you, including personalities, beliefs, values, interests, and lifestyles. Psychographics offer actionable information to focus on the psychological aspects of consumer behavior while helping to paint a more detailed picture of who your target audiences are and what motivates them. Demographic data provides details on “who” your customers are, including age, gender, income, marital status, and household size. Segmenting based on demographics is one of the most common ways to group and target audiences with similar attributes. Geographic data provides information on “where” your customers are. Geographic location is pivotal for targeting specific regions, specifically for global brands to tailor local promotions for each market. 1st party data is collected from your own audience and customers. In addition to data provided by DSP/DMPs, it’s important to consider all other data sources available to measure and maximize performance including campaign performance data, CRM data, social data, and website analytics. With your 1st and 3rd party data, build custom audience segments and glean insights about each audience segment to inform your data-driven creative and overall marketing strategy. By matching creatives to the audience segments provided by DSPs and DMPs, marketers can target their desired audiences more precisely, achieve message relevance, and customize creatives that resonate better with each audience segment. To help make the wealth of data from DSPs and DMPs meaningful, brands and advertisers can leverage technology to build unlimited creative variations that appeal to different audience segments. 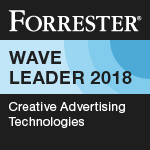 More specifically, ad technologies enable global marketing teams to improve their efficiencies and campaign performance by building, testing, tailoring, and optimizing creatives at scale. 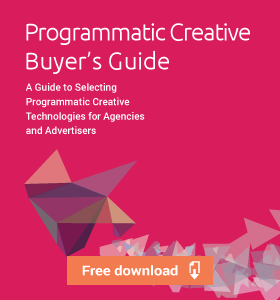 The two main approaches to achieving programmatic creative are Dynamic Creative Optimization (DCO) and Creative Management Platform (CMP). Both Dynamic Creative Optimization and Creative Management Platforms create opportunities to boost the impact of the creative. Dynamic Creative Optimization is similar to “ad factories.” They use data feeds to generate a large number of creatives on the fly and can algorithmically optimize ad creatives based on multivariate testing. These automated ad units are commonly used for large direct response campaigns due to the ability to dynamically pull in content like product prices and imagery based on data within the impression. Dynamic Creative Optimization particularly appeals to marketers and designers who require millions (or billions) of impressions for product remarketing campaigns. Setting up DCO ad units and operating Dynamic Creative Optimization requires technical and specialized knowledge, although software for these types of campaigns is becoming easier and eaiser to use. Typically, DCO vendors offer managed services to get their advertiser’s campaigns launched if self-service is not desired. Creative Management Platforms offer DCO functionality, but also contain “power tools” that enable creative variations to be generated rapidly and to pixel-perfection. 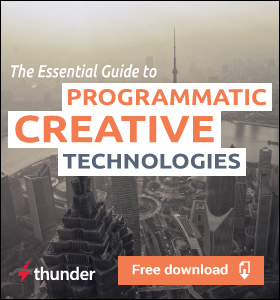 Building ad variations in Creative Management Platforms are similar to the existing production process for digital ads, but remove the high costs and lengthy turnaround time of building ads. The entire creative process is optimized for speed and scale. Creative Management Platforms use both manual and automated features to build a high volume of display and social creatives, or highly variable dynamic ads. CMPs appeal to creative, production, and ad ops teams who are looking to increase the speed and efficiency in producing data-driven creatives. CMPs also appear to marketing teams that want to cover more ground with one technology. With their ad tech stack, advertisers can leverage a CMP to replace generic ads with personalized ones that match audience segments in the DMP and optimize creatives using the DSP to find the best creative, media and data combinations. This DSP-DMP-CMP trio creates a virtuous optimization cycle, with each technology maximizing the ROI of the others to achieve high performing programmatic creative. To see the top players in the Ad Creative Landscape, check out this post. Need a consultation on your ad tech stack? Contact us to learn about Thunder’s DCO and CMP solutions. What are some examples of data-driven creative strategies? One example strategy is to develop a “content matrix.” This is essentially a table consisting of your targeted audience and the data touch points you may have. In a content matrix, you list out in the rows the defined audience segments that you have first or third party data on from your data management platform or another system like CRM. You’d then write in the columns all the places you may have a moment to deliver a message. For some closed loops marketers who can track a full customer funnel, the data touch points may be the moments when someone may enter a different stage of the funnel (example: prospect, site visitor, site abandoner, and converted visitor). With these columns and rows, you now have intersecting cells where a unique message could be developed and delivered so that the right person gets the right message at the right time. Without this exhaustive planning grid in a content matrix, you may be taking a less methodical approach to ensuring you have a personalized message for everyone but potentially a resource-saving approach. One such alternative is a “predictive creative” strategy. If your data management platform or dynamic creative optimization solution can track what audience segments sees what ads (creatives), you can build a model of what audience segments engage or respond already to a baseline creative. Based on the data, you may then choose to invest further in specific creative development for high reach, high response, or high-value targets determined by the model. As a result, you can use data to choose where to invest in further creative development. A related strategy is using audience insight to build out a creative concept. Using a DMP or a publisher’s proprietary audience insight tool (like Facebook’s Audience Insights), a creative developer may be able to find characteristics that relate to the target audience or sub-segments of audiences. These insights can lead to either new creative developed upfront and tested or new creative developed as you go with your campaign and seek to keep things fresh and continually searching for micro-optimization within audiences. A common strategy is A/B testing creative to figure out what works and taking those learnings, inform future creative development based on that or showing the winning creative more. What are some examples of data-driven creative tactics? After a strategist has determined how data can be used to inform creative development, someone closer to execution may make some tactical decisions. These tactics are really expressions of data in the ad. In one easy example, if you’re targeting women, you could put an image of a woman in the ad. In a more complex example, if you were targeting people in scorching heat waves to sell them a popsicle, you may want to put imagery that makes it feel hot. Some people may want to incorporate data in the content itself. Building on the prior example, you may want to actually put the current temperature in the targeted geography in the ad itself so people can know how hot it is outside. To do so, you would put a dynamic field in your ad and substitute into the field the information from a data feed (which can be real-time, updated regularly, or static in nature). Some dynamic advertisers may want to go as far as to show explicitly what they know about a customer they are targeting, including what they were previously looking at or had added to their shopping cart. This form of data-driven creative is known as product retargeting. Armed with these strategic and tactics, marketers can leverage the data they’re collecting and paying for to improve their advertising and become data-driven marketers. Data-driven creative enables brands, agencies, and publishers to deliver personalized, one-to-one messages to consumers from the moment they first interact with your brand to the moment they’re ready to make a purchase. 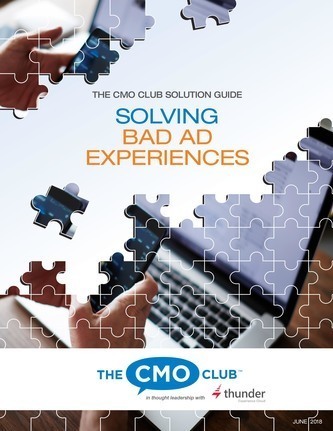 To increasingly build value for customers and deepen engagement, continue to test and make modifications to your unique marketing messages. Monitor the creative performance and optimize ads over time to maximize your ROI. By successfully executing data-driven creative, digital marketers can offer more purposeful and relevant experiences, expand customer relationships, and ultimately, build long-term brand loyalty and advocacy. 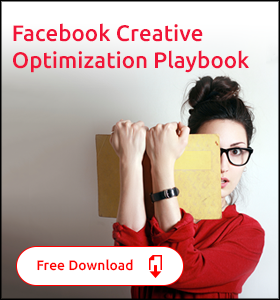 Learn more about how data-driven creative can transform your marketing in this eBook.